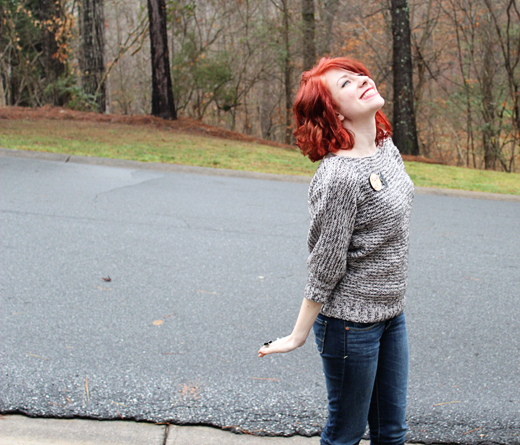 I’m Megan and I started up my blog and shop just a few short months ago. I had never really considered that I would be able to keep up with this amazing creative community, but then I figured I should at least try to prove myself wrong! So, here I am. I was born and raised in New Hampshire and now can be spotted wandering the streets of Philadelphia. If you see a rather tall gal with mismatched socks who is sporting a lovely sling and colorful cast then, well, you found me! I have always been interested in the world of crafting and making, but never thought that I could have my very own shop. Then I started getting back into knitting and was making things faster than I could give them away! A friend hinted at some awesome blogs out there that I should check out which took me on an evening internet tour of tons of inspiring and creative people. I noticed that maybe even I could give this a shot. What’s the harm, right? I still have that voice in the back of my head saying, “who would read this?” “you are not nearly interesting enough to have a blog” and things of that nature, but that’s kind of what keeps me going! You never know who’s going to find your blog, enjoy it, and stick around! 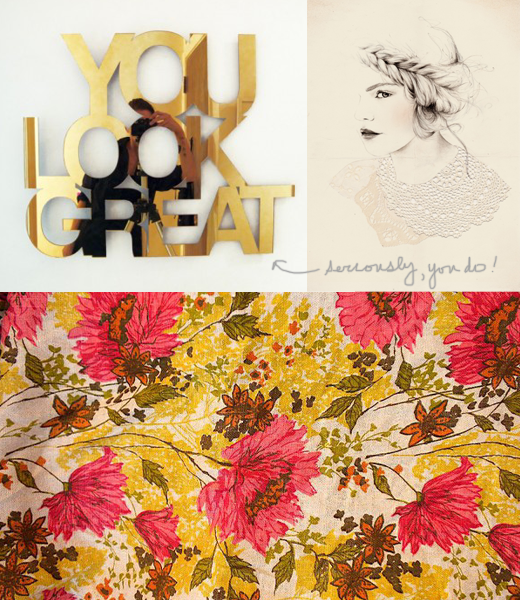 I like blogging about other crafters and makers that I admire. I am also the proud new owner of an awesome camera and absolutely can’t wait to take more pictures of the average day to day happenings. That may be my very favorite part of having my own blog and now that I have a functional camera I can do a lot more of it. My favorite things to make for my shop are probably headbands at the moment. I unfortunately recently did a rather graceful (and very unintentional) cartwheel off my bicycle and landed safely with a broken wrist. Needless to say I’ve been on a knitting hiatus, but before the fall, I couldn’t make headbands fast enough and wanted to make every color combination ever! Hopefully my enthusiasm picks back up when I can get back to my needles. I feel as though I go through pass-time phases. 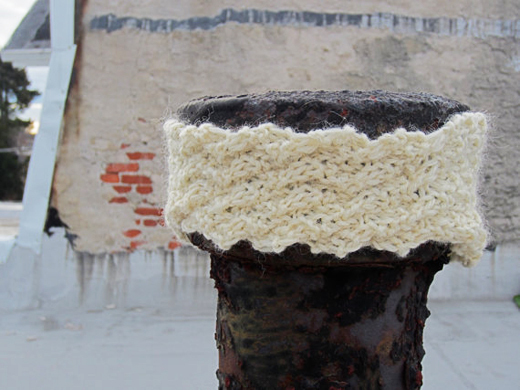 One month I will be reading non-stop and the next I can’t stop knitting. I might get really into baking and then I’ll switch to making a quilt. I get super into movie watching and then I will switch to painting. I’m not certain there is one consistent and stand-out favorite. Hmmmm, tricky. I am generally impressed by most things which makes my wish-list never-ending. 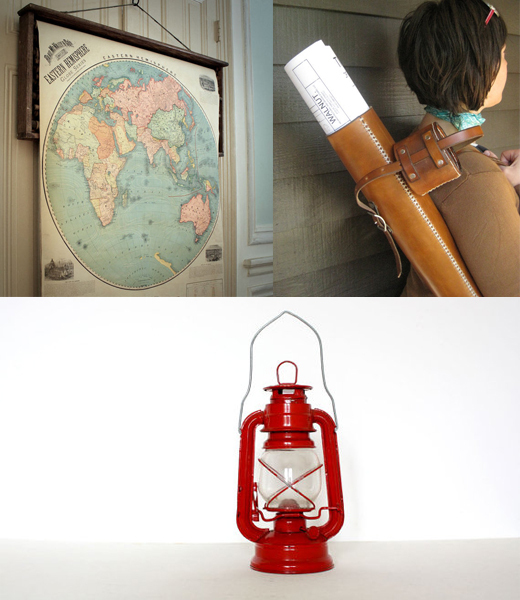 Lately, I’ve had my eye on a few vintage items… day dreaming really. la petite choue, one sheepish girl, The Dainty Squid, <3elycia, A is for Ampersand, sock monkey & gee, Tea Talk, and, of course, the always wonderful MaieDae! Oh goodness, I’m afraid I would be one of those people who would hold onto those wishes, content that I had them but way too indecisive to ever use them. Even today when I see a shooting star I give my wishes away to the people around me. If forced, I guess right now I could wish for my wrist to be healed! All of them? Do you get a sense for my indecisive nature yet? I love goat cheese just as much as I love spicy Thai food. It may be between the two (yes, I am implying that goat cheese is a meal. Wishful thinking.). Or fruit salad! I do love fruit salad. People! I get people crushes on just about everyone I meet. I love surrounding myself with awesome, creative, inspiring, wonderful people. It keeps my brain working and it keeps me happy and feeling lucky. Giveaway Time! 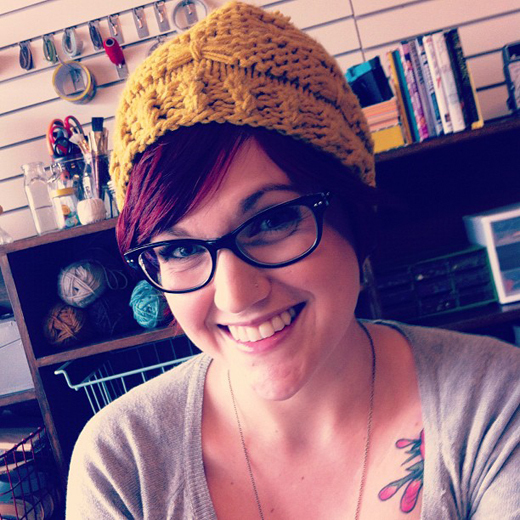 Megan is giving away a Knit White Wave Headband from her shop! Details on how to enter are below. 1. Leave a comment letting me know what your favorite item is from Megan's shop! 1. 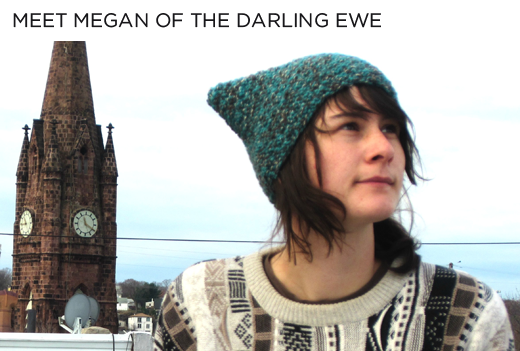 Take a visit to Megan's blog and leave a sweet comment! One winner will be selected at random and announced within the week!! Thank you Megan! This weekend, we spent Friday night having a get-together at our place and played "the game of things," which is now my new favorite game. :) On Saturday, Jenny and I got together for coffee and then spent a couple hours, inspired by the "No Brainer Wardrobe", purging her closet. We ended up collecting 7 trash bags full of clothes to donate to Goodwill! And today, Jon and I became an official member of our church! We've been attending since we got married, but finally made it official today. :) AND we moved in our new roommate for 8 months. Oh My Deer -- Chelsea is an extremely talented artist and does the most beautiful lettering. She designed my tattoo and also did some exciting new work for MaieDae. To be revealed soon!! * I get travel anxiety. * Attending a marriage retreat with Jon next weekend! Winner of the Geology Ring Giveaway is #125 Lydia! Please email me at Savannah@maiedae.com with your color preference and shipping information! 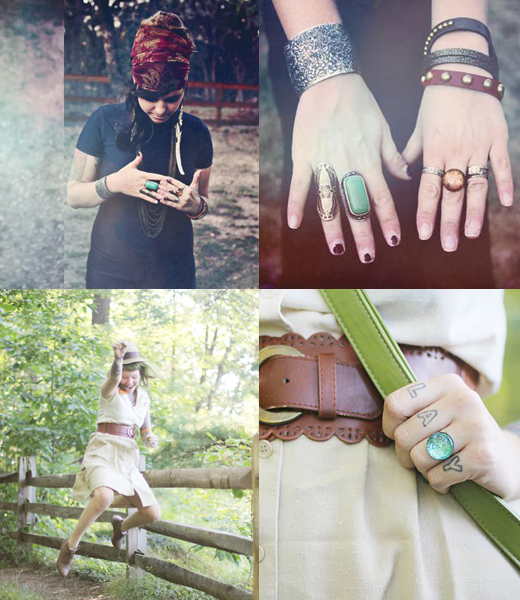 Winners of the Sponsor Spot Giveaway are Ciara of Glass and Sable & Michaela of Michaela Rae! Please email me your 175x125 sized button before the 31st! Hi there! I'm Kyla Roma- I write a creative lifestyle blog at KylaRoma.com, and I'm a web designer, puppy mama, wife, and a partner in Freckled Nest, a boutique web design company. I live in the middle of the Canadian prairies and love thrifting, making things with my hands (crafts, food & baking! ), analog photography, dreaming and turning those dreams into plans. Today I'm excited to share five things I've learned about one of my favorite things -- setting & accomplishing goals! 1. Dream Big and Set Expansive Goals. 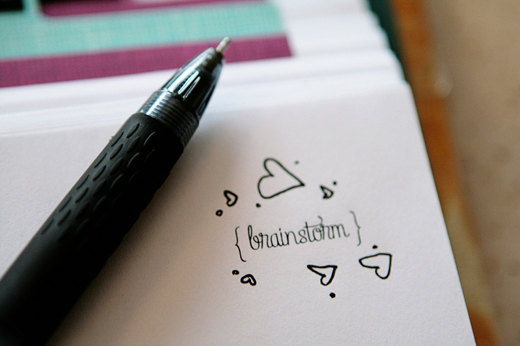 ---> It's important to start out dreaming big -- don't limit yourself when you're coming up with ideas and possibilities. My favourite way to do this is to write in my inspiration book, which is a journal I use just for dreaming big and gathering images that reflect my personal style. From there, I start focusing on what part of my dreams that I'm excited about, that line up with the year that I'm envisioning for myself, and that I feel are achievable if I work hard. Just make sure you start from a place of possibility before you hone in and limit your options. Once I've decided on what part of my big dreams I want to focus on, it's important to do a litmus test. Examine your feelings and trust your instincts! I love Marie Forleo's video post about recognizing time wasters vs. opportunities where she talks about asking yourself if your goals make you feel expansive or limited. Once you've moved past the dreaming stage, it's really important to ground the dreams that you're going to move forward on. If your dream or goal makes you feel trapped and worried that could be a sign that you're taking on too much at once. If your dream makes you feel nervous butterflies, like you're 20 feet tall, and that you can't wait to make it a reality, that's a great sign that you're on the right track. Keep going! 2. Break it Down -- Then Break it Down Again. ---> Big dreams mean lots of little steps to follow along the way, so be sure to break each of those steps down to the last detail. It will look like a lot at first -- don't freak out, lady! You've got this! Making sure that you account for all of the little steps along the way will make sure you can move steadily from stepping stone to stepping stone towards your bigger goal. Do you need to do a photoshoot for a blog post? That's a big topic- break it down again! Do you need to borrow a friend's camera equipment? Do you have a location in mind or do you need to scout one? Do you know how many different kinds of shots you need to have the post you want, and did you count photo editing as a separate task? It might take a while to achieve the bigger dreams on your list, but breaking your plan into bite sized To Do items will help you know as much of the path in front of you as possible. That's powerful! 3. The Trick is the Timing. ---> Now that you have an idea of what you'll be doing, think about when you'll be doing it and how long your steps will take. I can't tell you how many times I do one of these things but not the other- I'm great at planning when I'll get things done, but unless I force myself to estimate how long each task will take, I leave that part out and will be left scrambling when time runs out at the end of the day. The reality is that some things take no time and a little effort to get done and some things take a lot of time and all your effort! Knowing yourself and how you work best will help you make a successful plan. If you work best under pressure, don't give yourself all day for a big task. For some personalities, limiting your time will get you working fast and furiously and keep you from procrastinating. 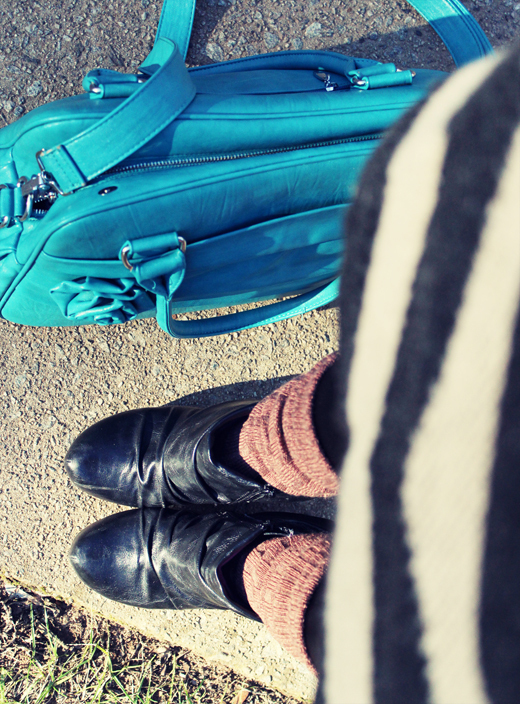 If you love planning in advance and taking your time (hello, that's me!) then start a week earlier than you need to so you can feel great about being ahead. Make sure to vary what you're working on too- if you have too many difficult tasks back to back, you could burn yourself out and come to a standstill, but planning could have navigated you through it. 4. Talk About it & Help your Support System Understand. ---> Enough of the internal work and goal setting -- once you have a plan and you know how you're going to get there, tell people! Share your project with your friends & family, post about your progress on Facebook, or blog about what you're learning along the way. Talking about your hopes and dreams breathes life into them and makes them more real -- both to you and your support system. If the people around you know what's important to you and what you're working on, they can better support and understand you while you're on your journey. While your friends and family might not get the whole picture of what you're doing, or might not be as comfortable with blogs and social media as you are, when you speak passionately about what's in your heart they will see that it's important to you. If you know that some people who are important that you share with won't get what you're doing, explain it in terms that they will. When I explain my blog and working on client web designs to my grandmother, I focus on the similarities to print branding that she's familiar with, and compare it to making a wedding invitation design or magazine design. Once we get past the terms that she's not familiar with, she understands exactly what I'm doing -- I'm telling stories, being creative, and loving what I do. A perfect understanding of what you're doing isn't necessary for the members of your support system to support why you're doing it. 5. Make a Regular Date with Yourself for Check Ins & Rewards! ---> Working on long term projects can wear even the most motivated person out, so a trick I use is to check in on my progress every week or month, and tie an immediate reward to how I do. It's a simple way to add perks along the way to the big reward of getting your dreams made into a reality! Maybe if you finish that photoshoot on time, you can treat yourself to daily Starbucks for a week? Or you could set up a video call with one of your best far away friends for the day after a project launches! (Maybe two days after, so you can catch up on sleep!). Your rewards don't have to be things and even if they are, they don't have to be expensive -- this is about knowing who you are and what makes you tick. If you can reward yourself for little pieces of hard work along the way, you'll be more likely to stay on track for the long term. The best part? That staying on track means realizing your dream, which is a reward in itself! I hope this has been helpful for you -- do you have a trick for setting goals and accomplishing your plans? Share it below! Kyla, I get super pumped about this topic too! This was a great way to really break down the process of goal setting and doing!! I loved your thoughts on tip #2 about breaking it down. I read an extremely helpful book called, Getting Things Done by David Allen that touches on breaking down your to-do's, setting up easy systems, and understanding your action items. Great read! Thank you for taking the time to contribute your advice (and passion!) to my readers! 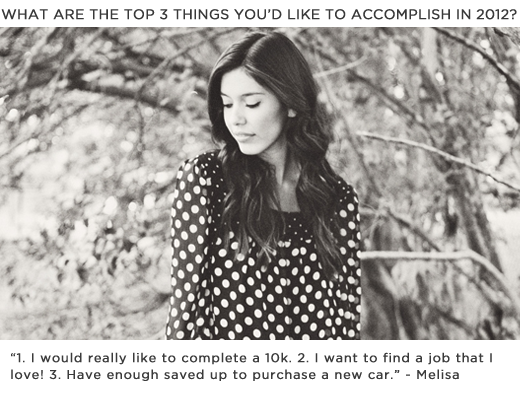 For this month's sponsor question, I asked my sponsors what they hope to accomplish in the new year. 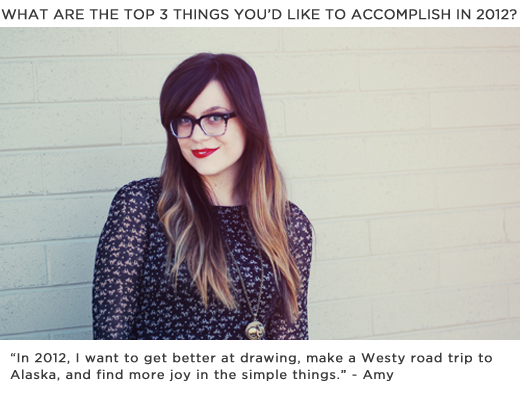 Melisa, Amy, and Jenny are definitely go-getters and I really enjoyed reading their answers! 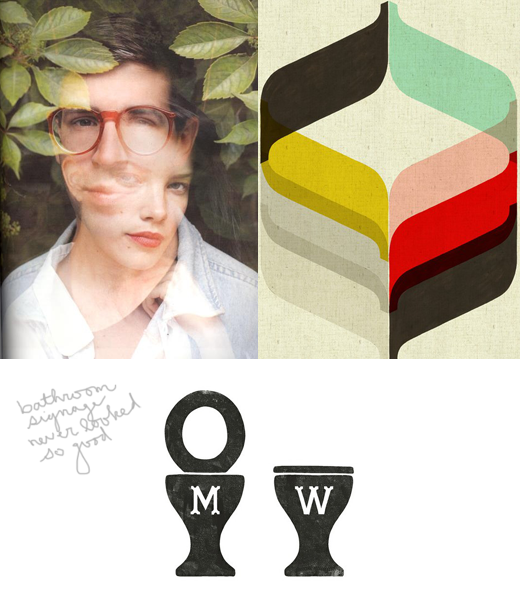 I look forward to following their blogs throughout 2012 and seeing their year unfold. 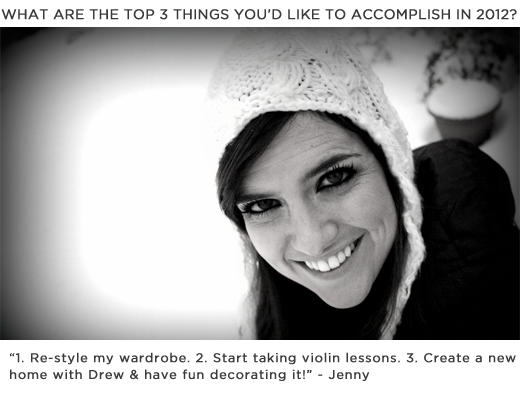 What are the top three things you hope to accomplish in 2012?? 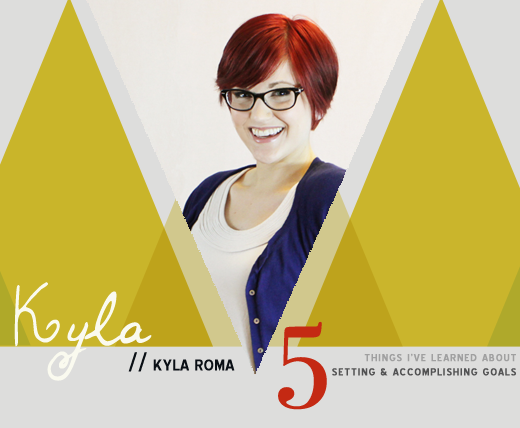 Be sure to check back later today for a new "5 Things" post by Kyla on how to set and accomplish goals! Look at that red!! Woah baby! I put some fresh color on my head last Thursday. I wanted something a little more vibrant and complimentary to my fair skin. I feel so sassy! 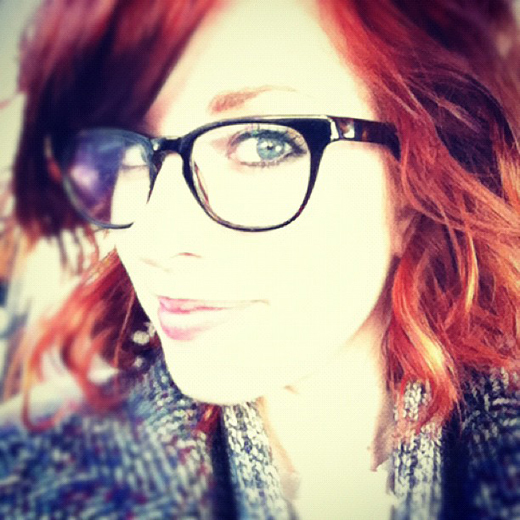 -- If you've been following me for any amount of time, you might have caught on that I dye my hair...a lot. BTW - My little sister, Kelsie, is amazing. She is usually the one to take pictures for my outfit posts and she's just as adorable as they come. * Square Black Ring: Forever21 - 6.5 years ago, I wore it at my senior prom! What about you? Does change make you nervous or do you experience a lot of joy in it? Let's talk about dating. :) One of the things I most treasure about my week is Wednesdays. Every week, Jon and I set aside a day, currently Wednesdays, that's dedicated to spending time and dating each other. We started this tradition early on in college and decided it was important enough to continue into our married lives together. Having a date night once a week allows both Jon and I the comfort of knowing that no matter how busy and overwhelming a week can become, we always have date day to unwind, talk, and spend intentional time together. I can't tell you enough how important this has been for our relationship and marriage. This time has allowed us to participate in each others hobbies, find interests together, talk about issues that might be pressing from the previous week, and work on us. It's too easy to get stuck in a routine and forget about investing intentional time in the most important person in your life. We've challenged ourselves to continue dating each other once a week, for the rest of our lives together. :) Because one day we will start a family. We will continue to be busy and pursue our dreams and we always want to be accountable to "us" time. 1. Set a Day. ---> Sit down with your schedules and figure out one day of each week that works the best for the both of you. This can be an evening after work, a morning time, or an entire day. Just find at least 4-6 hours each week you can dedicate to each other. Once you decide on your time, schedule it into your calendar, phone, agenda...whatever will remind you that every ________ is date night//morning//day. 2. Non-negotialble. ---> In order to be accountable to your date time, come to a "non-negotialable" agreement. This means that other events, parties, errands, to-do's will not come in the way of date time unless you decide as a couple it will be part of your date. Of course, some weeks will slip due to sickness, travel, and other life circumstances...but make it a priority for your week. 3. Get Excited! ---> Make your date time something you look forward to each week. 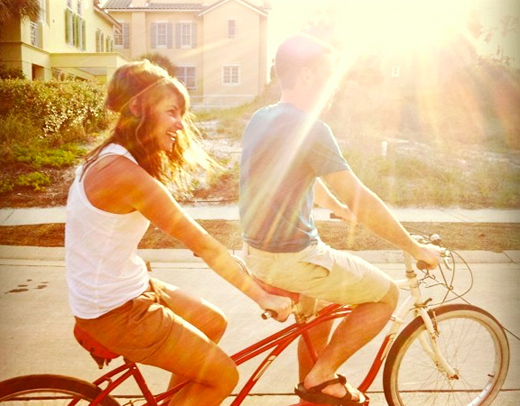 Make a list of fun ideas, take turns surprising each other each week with a planned date time, budget for date time each month so you have a little extra to go out if you want to, make 3 weeks out of the month simple and FREE and then spend one night each month going out and making it a bigger date! Over Christmas I was inspired by Naomi and Elsie on their "12 Dates of Christmas" posts. 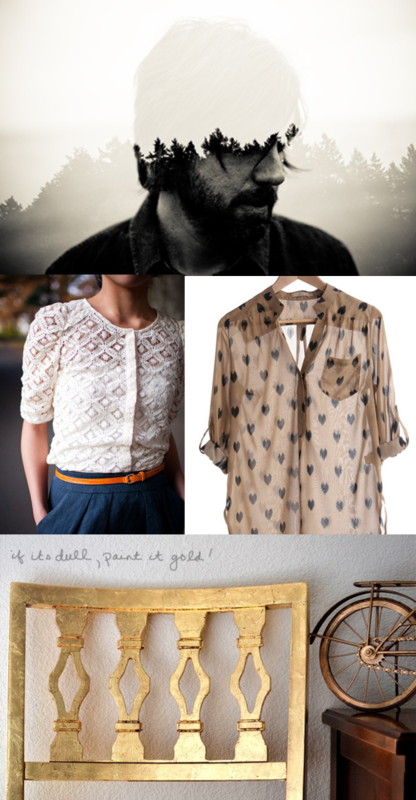 I thought this would be a great idea to apply to our date nights with a little twist! STEP 1: Each of you get 6 index cards and 6 envelops. Secretly, so the other doesn't see, write out your six date nights. They can be as simple or as elaborate as you wish. Jon and I split up some of the gift cards we received over Christmas to go in our envelops...you can also add cash limits, rules (have to hold hands, 2 minute make-out sessions every 30 minutes ;) ...etc. ), topics of discussion and, of course, fun things to do! Get creative and have fun! STEP 2: Once you write out your dates, slip each index card into a blank envelop. Put all 12 envelopes together and take turns shuffling to make sure you don't know the order. This is a great way to add some excitement to your date time. Each week will be a surprise! Jon and I just finished our first date last week and we'll be opening envelope #2 on Tuesday night to know what we will be doing Wednesday evening. I can't wait! 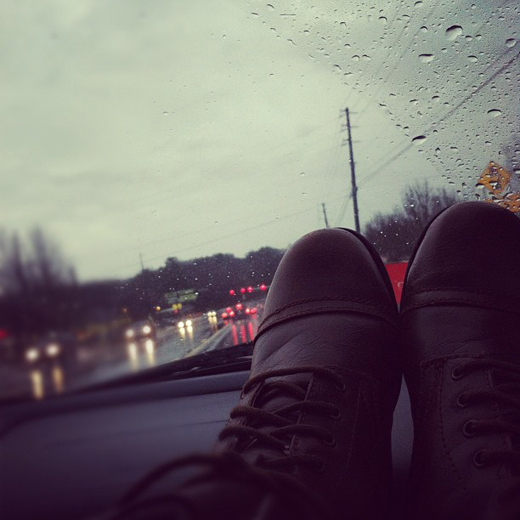 Snapshot of the Week: This is what it's looked like in Atlanta for the past three days. 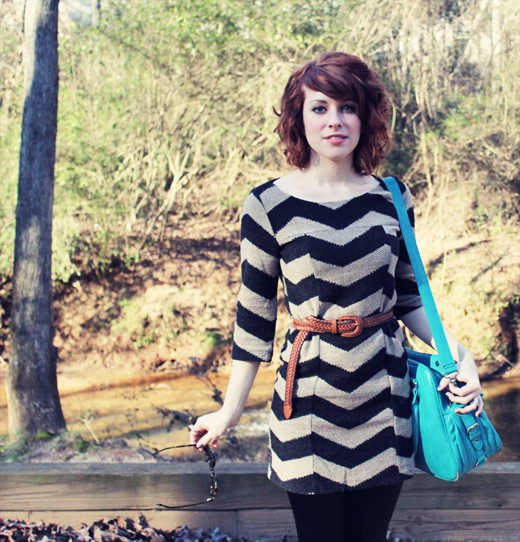 * Sunday Crossbow - Emerald is way adorable and has the cutest sense of affordable and creative style. * Altitude Summit - Seeing all of the tweets, pictures, and updates from the summit this year has me itching to save up and go next year!! Seriously. I gotta go...soo much awesome in one place. 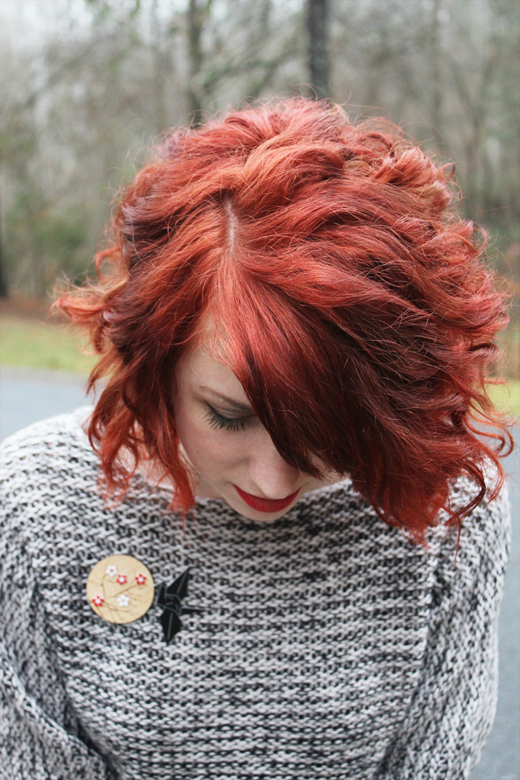 * Dyed my hair. Again! Pictures coming this week. * My sister is 17 and my brother is 19. Laura & Kaylah wearing our Geology Rings! 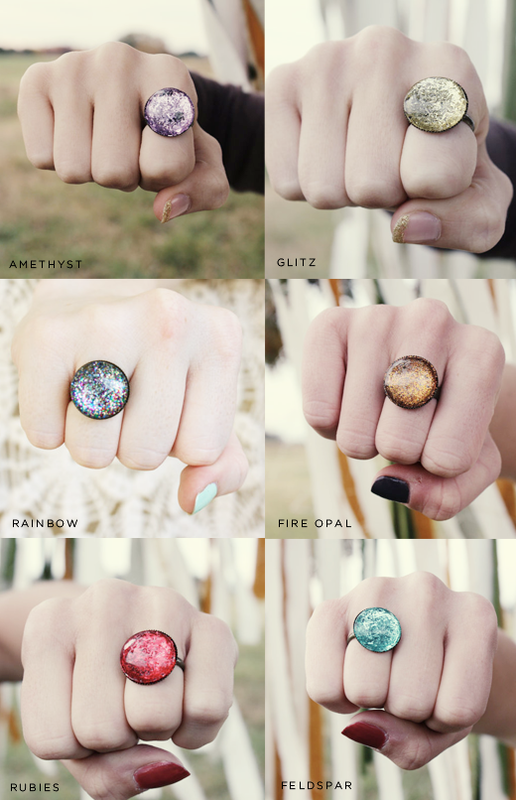 After a little hiatus from our shop, the Geology Rings are finally back! I've gotten a couple requests asking about when these sparkly little rings would return and I'm excited to announce their arrival in six colors. :) Each ring is set on an adjustable brass plated setting and is nickel//lead free. I love wearing this ring paired with other rings like Laura above. It's the perfect touch of sparkle! Want to add a little glimmer to your outfit? 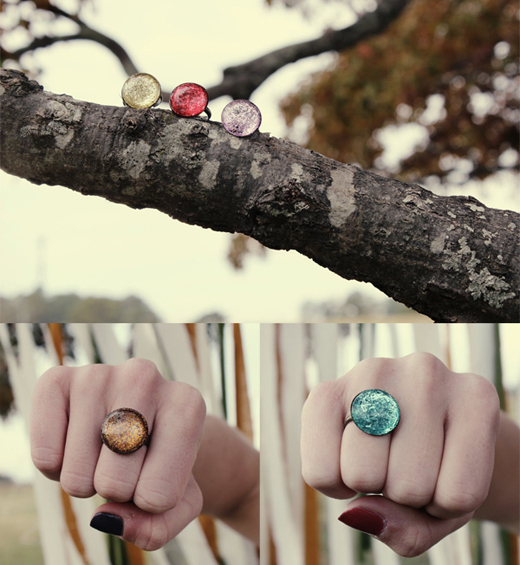 Win a Geology Ring in your choice of color! Details on how to enter are below. One winner will be selected at random and announced within the week. :) Giveaway is open internationally. * Follow Maiedae via Bloglovin. * Follow Maiedae via Facebook. * Follow Maiedae via Twitter. Three cheers for sparkles!! Best of luck! 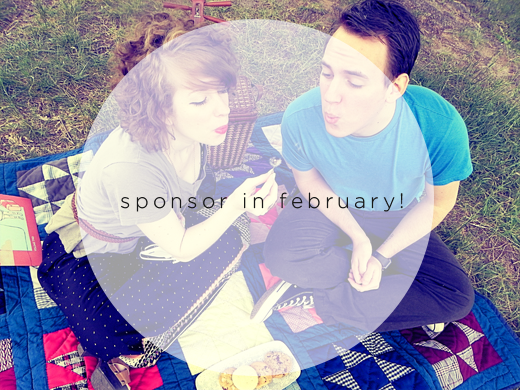 MaieDae is now accepting sponsors for the month of February! If you are looking for a place to advertise your business or blog, I would love to work with you! Win a free medium sponsor spot for the month of February! Don't worry; if you reserve a spot now and find out you win later, I will send you a refund and (if needed) upgrade you from a small to a medium spot. Later in the month, I will select and announce TWO winners! 1. Follow MaieDae via Bloglovin! 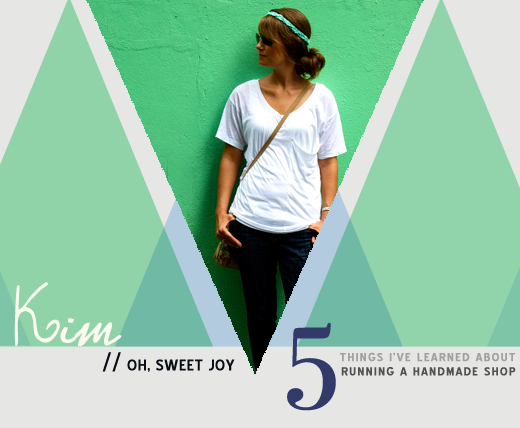 5 THINGS WITH OH, SWEET JOY! Hi MaieDae readers! 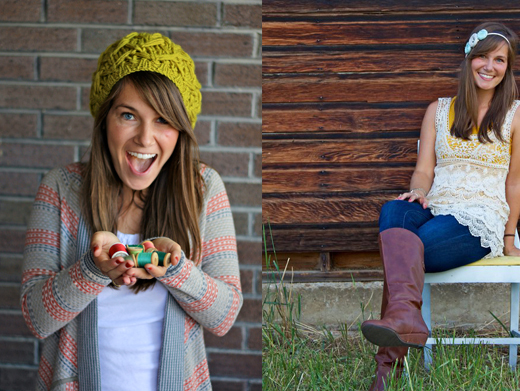 My name is Kim and I'm the gal behind the blog and shop, Oh, Sweet Joy! I am a Personal Shopper by day and a blogger//handmade veteran by night :) I live in colorful Colorado with my handsome husband, Chase. One day I will have an Airedale Terrier named Toby. You can read more about me here! 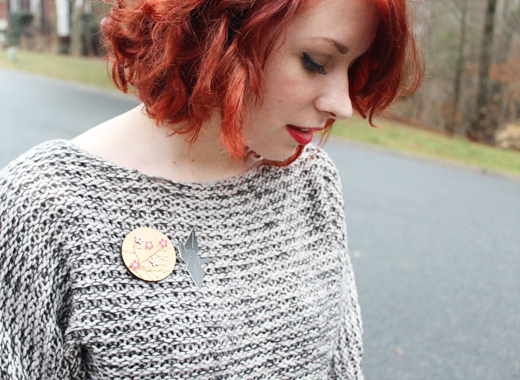 I'm really excited to share some things I've learned since starting this whole handmade thing. Running a handmade business has been one of the most difficult, yet rewarding experiences of my life. There have been so many ups and downs -- and thankfully more ups than downs! It's been quite an adventure and I'd love to take you along for a bit of the ride and share a little bit of insight into the world of Oh, Sweet Joy! and owning a handmade business. 1. Take a Day (or Two?) Off. ---> It is so important to take breaks....and guess what? It's okay to take a weekend off! It's vital for your sanity, for your marriage, for your inspiration level, and that's just the beginning of it! Take a book to your favorite coffee shop and snuggle up reading all day. Spend a day blessing others. Make something for yourself. Take a long walk. Whatever relaxes you, do it. And don't think about the orders that may or may not be piling up while you do so. They'll still be there Monday. 2. Quitting Your Day Job Isn't All It's Cracked Up to Be. 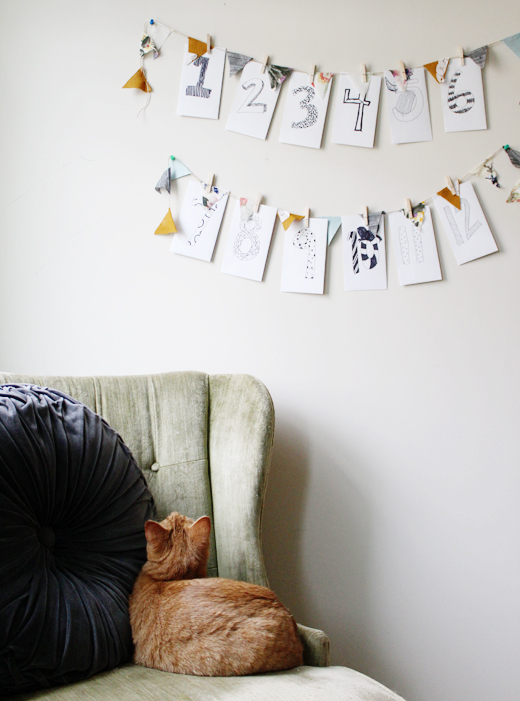 ---> It's okay to love your 9-5 and want your handmade biz to be nothing more than a hobby. I learned this after a mere 5 months of doing the whole "handmade thing" full time. ((more about that here)) I was burned out and missed interacting with people IN REAL LIFE. Don't get me wrong, blog//handmade friends are great, but I don't think God created us to live behind computer screens. I think in the handmade world, somehow the standard became "you aren't successful unless you are full-time." It's simply not true. Only you can define what success is to you. Is it $100 a week? Is it $1,000? That's your call & only you can make it what YOU want it to be. Hobby, part time, full time, a vehicle to bless others, you name it. 3. *sing with me* Money money monnnneyyyy ((money!)) ---> Keep your finances straight. SET A BUDGET. Know how much you're making. Keep receipts. Buy Quickbooks or use Mint.com to track your business expenses. Tithe. Be generous. If your intentions are to turn a profit, you are a business and need to pay taxes. Set up an LLC and play it safe by doing things right from the get-go. No one wants the IRS knocking on their door! 4. Grow. ---> It's important to set goals so that you don't become bored or uninspired. This also helps you grow your business and push the limits! Don't be afraid to push yourself or try new things. I did a series back in the day of how to increase your sales. Part 1 and Part 2 might be helpful if you're just starting this handmade journey or if you're in a slump. 5. Treat yo'self. ---> Go ahead and FIRST click here and watch this 20 second clip, giggle, and then come right back. Wasn't that silly pants? Okay, moving on. This goes back to setting goals. I am a very goal oriented person. I tell myself often, "If I make ((this much)) money in the next month, I will treat myself by purchasing ((this really special thing I couldn't live without that usually comes in the form of shoes that I'll probably take to Buffalo Exchange in 3 months)). It's okay to buy something fun using the money you are earning. In fact, it may just motivate you to work harder and make more! This can work on a smaller scale, as well. I would often times tell myself that if I made & packaged all my orders by noon, that I could go get Starbucks and walk around the mall & window shop. Is it because I *deserve* it? No. It's because I wanted to and that's all that mattered. Hrumph. Being a business owner has perks and we've GOT to take advantage of them! (*WINK*) *note* it's even MORE fun when you buy something special for someone else. Last year, I was on a clothes buying hiatus and I bought my husband a new camera with the money I'd earned from Oh, Sweet Joy! rather than something for myself. It was so fun to treat him with something he will enjoy for years..
Kim! Seriously, you are so inspiring. :) Thank you so much for offering such great advice! You are SO RIGHT about taking time off. It's so, so important to have days to rest, be with family and friends...and make sure your life is in check and on balance. Also, you are hilarious...thank you for making my readers and me giggle! 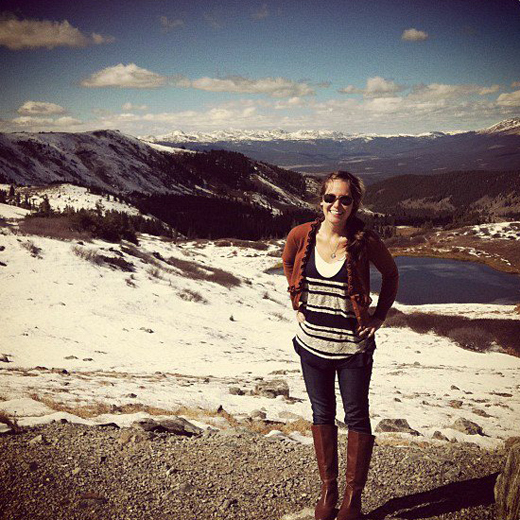 This past weekend, I finished reading "The No Brainer Wardrobe" e-book by Hayley Morgan. It was a quick and definitely a perspective-changing read. Hayley's book explains how to shop intentionally for your closet, purge your current wardrobe, build your wardrobe up over time with pieces you feel great in and how to create a lookbook to keep you inspired. Her steps are extremely practical and helpful. I'm currently in the "purging" phase and trying to figure out what pieces I need to add. 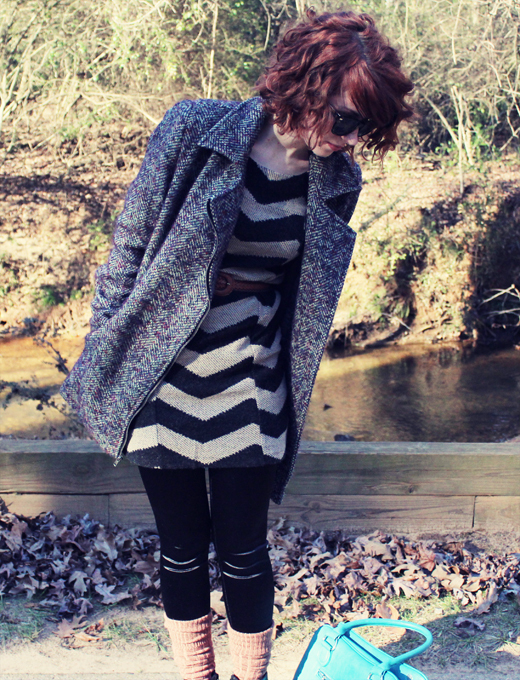 If there's anything about my personal style I know, it's that I love layering and mixing texture and pattern. I especially love pieces with a unique touch. >>> 1. I can't stop wearing these fancy black blowfish booties. 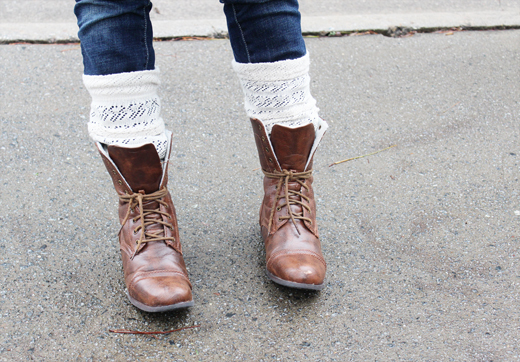 I love how edgy, seriously comfortable and easy to wear they are. >>> 2. I'm wearing my new prescription sunglasses from Warby Parker. 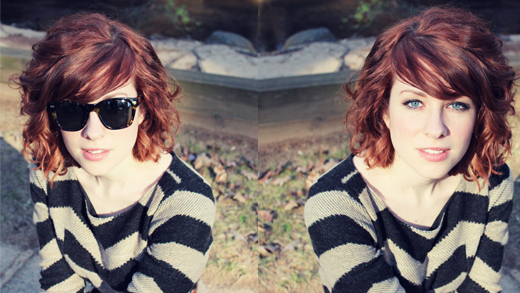 This is a big deal for me, because it's the first time I've been able to wear sunglasses...and actually see! I don't wear contacts so I'm strictly a glasses girl. I. LOVE. THESE. Best thing ever to drive down the sunny road and not have tears streaming down my face from the brightness. >>> 3. This jacket goes with everything, and has the best pockets. * Everett Prescription Sunglasses: Warby Parker - Call to order their sunglasses as a prescription. I hope you have a wonderful Wednesday! Tonight is date-night, so I'm looking forward to starting the first week of Jon and I's special date-night calendar. 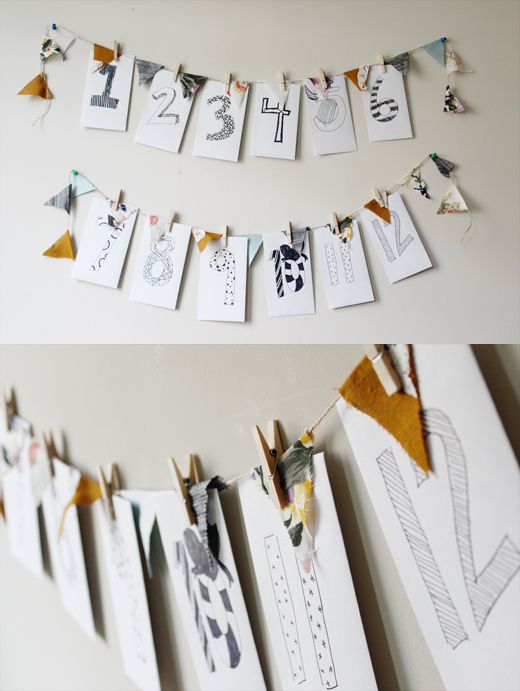 DIY post coming later this week!